Rarely do you get a public moment that elicits the amount of shock, confusion, and joy as the one that occurred last night when it turned out that Moonlight and not La La Land had won the Oscar for Best Picture. But the telecast could not show the complete range of perplexed celebrities. Luckily, other cameras were present. This morning, a Los Angeles Times photo is making the rounds that documents the wide-eyed reactions of the front row. Matt Damon, Busy Philipps, and Michelle Williams looked dumbfounded. Dwayne “The Rock” Johnson somehow managed the perfect eyebrow raise. 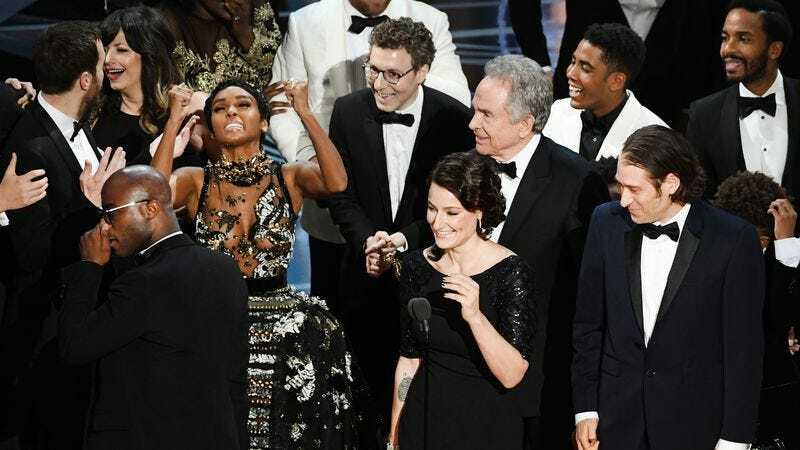 Meanwhile, Deadspin snagged a clip from ABC’s backstage live feed, which tracked the Moonlight cast and crew as they made their way to the stage in astonishment. Trevante Rhodes grabbed his chest. Naomie Harris searched for recognition in the crowd, where Isabelle Huppert looked on. But analyze the footage more closely and you’ll find some other hilarious expressions. Shirley MacLaine, whose brother Warren Beatty was blamed for the mishap, was taken aback. Meryl Streep had never seen anything like it in her decades of Oscar-going. The mercurial, be-hatted Mark Rylance watched with what we interpret as glee, and the perpetually chill Jeff Bridges seemed to get a good laugh out of the whole thing. In the distance, Toni Erdmann director Maren Ade was on her feet while Moonlight kids Jharrel Jerome and Jaden Piner celebrated a few seats away, based on the following Getty image.